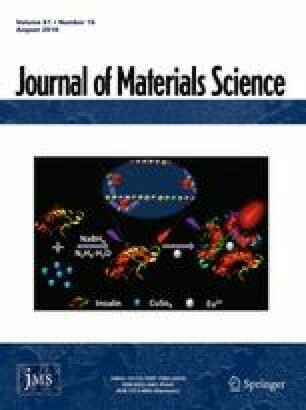 Anatase TiO2 nanoparticles were synthesized from sol–gel processing, and they were used as a precursor for titanate nanotubes (TNT) formation. TNT were synthesized under reflux heating of anatase TiO2 in concentrated NaOH solution followed by repeated washing with distilled water and 0.1 M HCl. The nanotubular structure was preserved till 450 °C, above which nanorod formation started. The as-synthesized nanotubes were found to have mixed crystal structure of anatase and Na x H2−x Ti3O7·nH2O (where 0 < x < 2), contrary to what has been reported before. The XRD peaks of titanate were slightly shifted to higher angles upon calcination along with prominent anatase peaks. Complete transformation to nanorods occurred at 600 °C and crystal structure was transformed to Na2Ti6O13 and anatase. Sodium presence in TNT was confirmed by EDX, and Na–O and H–O–H along with Ti–OH vibrations were found by FTIR. Ti–OH/H–O–H vibrations were less prominent for samples calcined at 500 °C and above, which confirms structural water loss is associated with morphological change. The as-synthesized TNTs had a specific surface area of 157 m2 g−1, and it decreased by increasing calcination temperature. TNTs were applied to methylene blue aqueous solution to observe their decolorization capability under UV irradiation. The as-synthesized TNTs showed enhanced photocatalytic decolorization as compared to anatase titania nanoparticles due to presence of Ti–OH groups and higher specific surface area. The photocatalytic activity reduced when TNTs were annealed at high temperatures. The changes in the photocatalytic activity are related to the existence of hydroxyl groups in the structure, decrease in specific surface area of annealed nanotubes, change in morphology from nanotubes to nanorods, and bandgap shift to visible light when TNTs were calcined at higher temperatures. The authors would like to acknowledge the facilities provided by Aalto University Nanomicroscopy Center (Aalto-NMC) for FTIR and UV/Vis spectroscopy measurements. Raman spectroscopy work was carried out at Low Temperature Laboratory, Aalto University, and we are thankful to them. Help of Ajay Iyer for Raman spectroscopy is acknowledged.